Minarik Drives expanded the XP series of low-cost, high-performance, pulse-width-modulation (PWM) DC drives to offer the PCMXP02-115AC, which accepts any external analog process control signal from 0 to 10VDC. 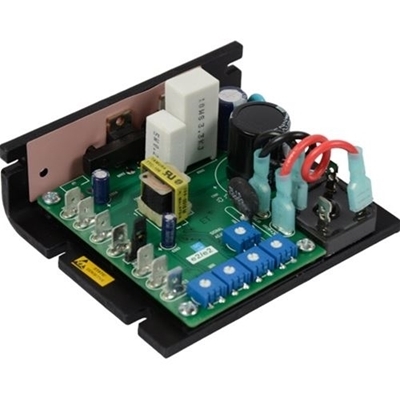 Users can operate the drives in two distinct modes: manual mode using normal potentiometer operation, or signal mode: operation from an external signal input only. Standard XP drives are versatile and accept any voltage ranging from 70 to 130VAC. XP drives contain a unipolar power supply, which enables them to accept any DC volage input between 100 and 160VDC. Users, after proper calibration, can operate many low voltage motors without additional circuitry. The PCMXP02-115AC yields a constant 1.05 form factor or less over the entire 80:1 speed range resulting in smooth, quiet, cool and low maintenance motor operation.